Elliot Schneider once said in 1977: "'The pen is mightier than the sword?"' Words ARE a sword. Just move the 'S.'" Elliot's lyrical sword & gentle caresses sweep across joyous melodies reminiscent of The Beatles, The Stones & Elvis Costello. 5. Are We Only Dinosaurs? In the summer of 1969 when men first set foot on the moon, I met Les Paul in Chicago. I was visiting the daughter of his former drummer Tommy Rinaldo. Mr. Paul was both warm and sardonic. He invited me to travel back to New York with him, “Ten Years After” and Dusty Springfield. Strangely enough, I said, “thanks, but I can’t,” and so he gave me his card and invited me to his home in Mahwah, New Jersey. I played for him at his home in March of 1970 and he wanted to produce my song, “The First Day Of Summer.” Alas I took an LSD trip that lasted a month—my last acid trip—and wound up 3,000 miles away in La-La Land. Forty-seven years later I finally recorded that song. 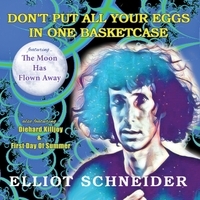 And it appears on my new CD, “Don’t Put All Your Eggs In One Basketcase” along with the rocketing single already charting in Germany, “The Moon Has Flown Away” (weeks before the actual release date). In San Francisco I performed as Elliot Schneider and The Pitts but then transmuted into Elliot Schneider and The Banned. David Quaife, the brother of Pete Quaife (co-founder of The Kinks) and the head of the Pete Quaife Foundation discovered my music. I am so honored that a song of mine appeared on a compilation with all the legends of rock and roll (Roger McGuinn of The Byrds and Noel Gallagher of Oasis, etc.) in order to raise money so that children can get the dialysis and help they so need. Through the Pete Quaife Foundation, David is saving the world one child at a time. The opening song on the CD, “I’m The One” also reached #5 on the German station Radio Marabu, “Europe’s Alternative Music: 104.9 FM.” “(I Ain’t Got) No Self-Control,” “Heaven Is In Your Heart, Baby,” “I’m Back In The USA (hit #3) and “If Looks Could Kill, I’d Wear Mirror Sunglasses” also rocketed into their Top Ten. “Heaven Is In Your Heart, Baby” hit Number One at Q108 in Kingston, Canada. Radio Caroline features all of these, too; but the dynamic rocker, “A Key To You” tended to get the most airplay there. On Friday March 18, 2016 after we got off stage in Austin during SXSW Week (RedGorilla Festival), we were played for the first time on Sirius XM Radio on Little Steven’s Underground Garage station. What a magical evening! My second CD, “If Looks Could Kill, I’d Wear Mirror Sunglasses,” was released in June of 2012 and received extensive international airplay including on the BBC Radio Merseyside, Radio Caroline and KROQ. It also reached number 8 on WLFR in the New York Metropolitan area. But the release of, “Better A Fool Than Aloof” took me into new territory. Reaching NUMBER ONE on WLFR caused me to levitate into the ceiling fan. My new album, “Don’t Put All Your Eggs In One Basketcase” is officially released on July 24th, 2017. But there is a great swelling of excitement worldwide. Even before it its release, the legendary British station Radio Caroline has been playing the opening track, “The Moon Has Flown Away.” FM stations in Maui, Hawaii have also jumped the gun with airplay. And within one week, “The Moon Has Flown Away” hit #12 in Germany on Radio Marabu: 104.8 FM in Osnabrück and Kurzwelle. I hope you will share this exploration with me… it’s never too late to live your dreams. A dozen years ago, I fought a war with breast cancer and was, in a sense, reborn. I’m 70 years old; I can’t wait for the next 70. My mother died of breast cancer when I was two. She was only twenty-seven. She got cancer when I was one. My earliest memories are of life and death. In response I lived passionately every moment. Instead of waiting until my sixties, I retired in my twenties and thirties when I was young enough to really enjoy it. I had more adventures than could fit in twenty volumes and I lived without fear. I drank with hoboes; I drank with a member of the Kennedy administration whose daughter was the Queen of Jordan. Linda McCartney and I spoke of the death of her mother and my own father. I lived for love and traveled the planet, Peter Pan masquerading as Captain Hook but always being Elliot. I’ve been blessed with love affairs that read like fantasy--I love my life. I’ve played guitar with Les Paul and danced around knives in New York. Surfing on the present moment I’ve known a lot of ecstasy and even heartbreak. Because I’ve always done what I want, I have no regrets. Every day has been magical. One day I gave up the Holy Grail of Rock ’n’ Roll and went through the Looking Glass. I became a history and philosophy teacher and became the father of two dazzling suns. Who needs reincarnation? We all live many lives in a single lifetime. Since I always loved women (perhaps searching for the mother I never had), it seems only fitting that I, too, got breast cancer. More than half a century ago, there was little they could do for my mother. We live in a different world now. I beat cancer; and I retired from my retirement from Rock ’n’ Roll. I fell in love with Carmen Castro, the love of my life—and my keyboard player. I met her because I taught all three of her kids. We were friends for sixteen years before I fell into her eyes. And I am still falling. Every day I try to feel ecstatic. The moment is immortal even if we are not. I can live with the fact that I’m going to die. I’ve never waited for the Afterlife—I live now. I’m still going to die and yet the world is still thrilling me. If we spend our life fearing death, we never live at all. My purpose in life has always been to really live before I die. There are stories I still want to tell. When death finds me, I’ll be kicking, gouging and scratching all the way. If I could live forever, I would. How could you be bored with the universe all around you? So I ask you: Is there life after birth? I’ve been working with Eric Borst since he was 15 years old. When SF Weekly reviewed us, Cary Tennis said of his drumming: “Eric’s got the power and madness of a Keith Moon and a precision Moon would have paid money for.” He is the heartbeat of Rock & Roll. When he plays, the world leaps up and dances. Mark Banning is the best guitarist on the planet for my music. He belongs with Jeff Beck, Carlos Santana and Keith Richards on the Mount Rushmore of Rock. And on stage Banning and I are like cartoon characters impersonating igneous rock stars. Tyler Jensen is our perfect bass player. He is the gentle giant whose melodic driving bass lines form the skeleton from which the songs themselves emerged as we recorded them. He is a quiet man, a brilliant man. When he speaks, it’s wise to listen. Mark Newstetter has been my close friend since 1973. His virtuoso guitar work and Paul McCartney-like harmonies have been gracing my recordings ever since. There is nothing he can’t do musically. I am in awe of him. Cirrone, who sing the celestial three-part backup harmonies on ‘The Moon Has Flown Away,” is simply the greatest Rock & Roll band in Italian history. Thank you, in alphabetical order, Alessandro, Bruno and Mirko Cirrone, a trinity of Sicilian brothers. Brad Barth is my genius recording engineer and co-producer along with Carmen and me. He is our true brother as long as we walk the Earth. He also plays the piano part on ‘Captain Argent.’ Brad is the keyboard player in ‘Gamma,’ the classic band formed by the late, great Ronnie Montrose. Brad is my personal George Martin. Carmen’s keyboards wrap around my voice and guitar like strands of DNA. We are one being. Without her I don’t musically exist. And my life would be empty. She is my muse. Carmen Castro resurrected me after I beat breast cancer. Her keyboards define my sound along with Mark Banning’s guitar work. She also co-produced this album. She is the love of my life. --San Jose Mercury News and Oakland Tribune in a major feature article by Jim Harrington gracing the cover of the local section. The musically dynamic and absolutely wondrous K.C. Cormack plays guitar and sings harmony on “In A Sense Innocence.” Together we have rocked audiences in multiple continents. Behind his shyness lies a volcano of musical power. Brad Stoller has been a dear friend of mine since 1973. When he plays guitar and mandolin he channels the music of the spheres. Listen to the mandolin part on “First Day Of Summer.” That is his soul. Felice Ford, Harvard graduate in Greek Classics, plays castanets on “The Moon Has Flown Away.” (The same castanets her grandmother played when she danced Flamenco with the legendary Segovia brothers.) Felice is my Water Daughter which rhymes as she does with me. Now don’t I look kinda cute? Wouldn’t you like to lose yourself in a poem? We are the animals who are aware that we are aware and manipulate symbols in the process. To be less than aware is to be less than human. We destroy anything we don’t understand.